Racial and Ethnic Groups 14 Edition NOTE: You are purchasing a standalone product; MySocLab® does not come packaged with this content. If you would like to purchase both the physical text and MySocLab, search for ISBN-10: 0134126963 / ISBN-13: 9780134126968. That package includes ISBN-10: 0133770990 / ISBN-13: 9780133770995 and ISBN-10: 0133842983 / ISBN-13: 9780133842982. MySocLab should only be purchased when required by an instructor. For courses in Race and Ethnic Relations Understand the changing dynamics of the U.S. population Understanding race and ethnic relations is essential to understanding the United States – where we’ve been as well as where we’re going. 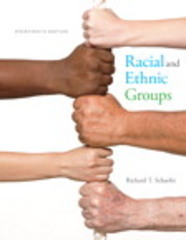 Throughout the fourteenth edition of Racial and Ethnic Groups, author Richard T. Schaefer helps students view race and ethnic relations in a socio-historical context, so they can understand the past and best shape the future. The text’s student-friendly framework is packed with engaging first-person accounts that illuminate the changing dynamics of the U.S. population, and reveal the stories behind these changes. Incorporating the latest statistics and data, Racial and Ethnic Groups enables educators to stay current in this ever-changing area of study. Also available with MySocLab MySocLab for the Race and Ethnicity course extends learning online, engaging students and improving results. Media resources with assignments bring concepts to life, and offer students opportunities to practice applying what they’ve learned. And the Writing Space helps educators develop and assess concept mastery and critical thinking through writing, quickly and easily. Please note: this version of MySocLab does not include an eText. Racial and Ethnic Groups, Fourteenth Edition is also available via REVEL™, an immersive learning experience designed for the way today's students read, think, and learn. Learn more.